Cortez Kennedy at the 2012 Pro Football Hall of Fame enshrinement ceremony. 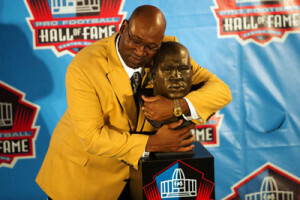 Cortez Kennedy, a 300-pound but nimble defensive tackle for the Seattle Seahawks in the 1990s who was inducted into the Pro Football Hall of Fame in 2012, was found dead on Tuesday at his home in Orlando, Fla. He was 48. A spokeswoman for the Orlando Police Department said that there was nothing suspicious about Kennedy’s death but that it was being investigated. He had been experiencing headaches over the past week, his stepfather, Joe Harris, said in a telephone interview. Kennedy was unexpectedly quick for his size, which enabled him to explode off the line of scrimmage when the ball was snapped. He became the prototype for the strong, 300-pound-plus defensive linemen of the 1990s in the N.F.L. chosen in the 1990 N.F.L. draft out of the University of Miami, played his entire 11-year career with the Seahawks. He was named by The Associated Press as the league’s defensive player of the year for the 1992 season, despite Seattle’s 2-14 record that year. Kennedy also played in eight Pro Bowls. In an interview with The New York Times in 2015, he said that when he became a multimillionaire with his first contract, Mr. Harris told him to buy what he liked in his roo-kie season, but save money afterward. So he bought six cars — one for his mother, one for his girlfriend and four for himself — but he sold two of his when he saw the bill for the auto insurance. He adhered to a rigorous budget for the rest of his career. Kennedy had 58 sacks and three interceptions in his career. He also returned one fumble 39 yards for a touchdown. Cortez Kennedy was born on Aug. 23, 1968, in Osceola, Ark., and grew up in nearby Wilson. When he told that story at his Hall of Fame induction, he called his mother’s disciplinary action “the turning point of my life.” He went on to graduate from Rivercrest. Kennedy played on mostly losing teams in Seattle and in only one playoff game, a loss to the Miami Dolphins in 2000. In addition to his mother and stepfather, he is survived by his daughter, Courtney. Further information about survivors was not available. His marriage to Nicole Sanders ended in divorce. In recent years, Kennedy was an ambassador for the Seahawks and an adviser to the New Orleans Saints, whose general manager, Mickey Loomis, worked for the Seahawks when Kennedy played there. Miami Dolphins: Why’d It Take So Long to Become Good? Miami Dolphins: Is This the Beginning of the End of the Season?